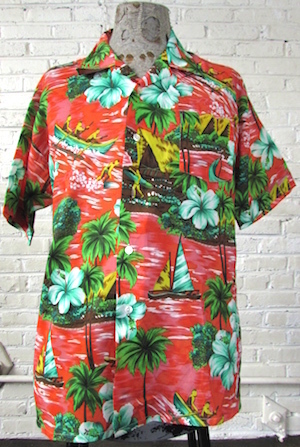 Home > Men's Vintage Shirts > Hawaiian Shirts > (XL) Vintage Mens 70s Hawaiian Shirt! Hot Pink & Orange! Surf Dudes & Mint Green Flowers! 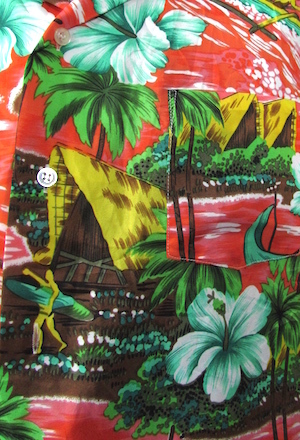 This super wild vintage Hawaiian shirt is like wearing a tropical paradise! Little yellow men surf and canoe over a hot pink & orange ocean to tiny islands with small beach huts and palm trees! Gigantic mint hibiscus flowers hover in the foreground just out of reach of the boys of summer. Has a wide collar and closes in the front with pearlescent buttons. Has one chest pockets and a straight hem. The perfect shirt for your tropical day dreams! Tagged by Juan Carlos. 100% Polyester.